Summer may have only just arrived, but quilters like to look ahead. Jeanne Large and Shelley Wicks are used to the long Prairie Winters of Saskatchewan and have embraced the season with this, their fourth book in the seasonal inspired series. “Here Comes Winter” boasts an expanded format with 96 pages and 19 projects ranging from pillows and table toppers to lap quilts. Building on the easy piecing, chunky applique, and earth-toned color schemes introduced on the earlier books these patterns and projects will speak to a wide quilting audience from beginner to advanced. Keeping the long winter months in mind Jeanne and Shelley pushed their designs for “Here Comes Winter” beyond the usual Christmas inspired projects. The trotting reindeer, over-sized snowflakes and whimsical snowmen are well suited to adorn any home from the time the first snowflakes accumulate outside till the snowmen begin to melt in the warm spring sun. The book is well presented. Full color images and diagrams inspire the quilt maker to plan and finish any of the projects featured in this book. Detailed instructions and supply lists ensure the quilter has everything on hand before embarking on cutting, piecing and sewing. Whether the quilt maker is interested in creating a new decor item for her own home or for a friend as a gift, the individual projects are varied and leave room for personal expression. “Here Comes Winter” will delight any quilt maker interested in adding a country flair to their cozy winter home. The book is available in book stores and quilt stores across the country now with lots of time to get ready for winter, which is sure to return before we know it! 11 Jul	This entry was published on July 11, 2014 at 7:19 am. 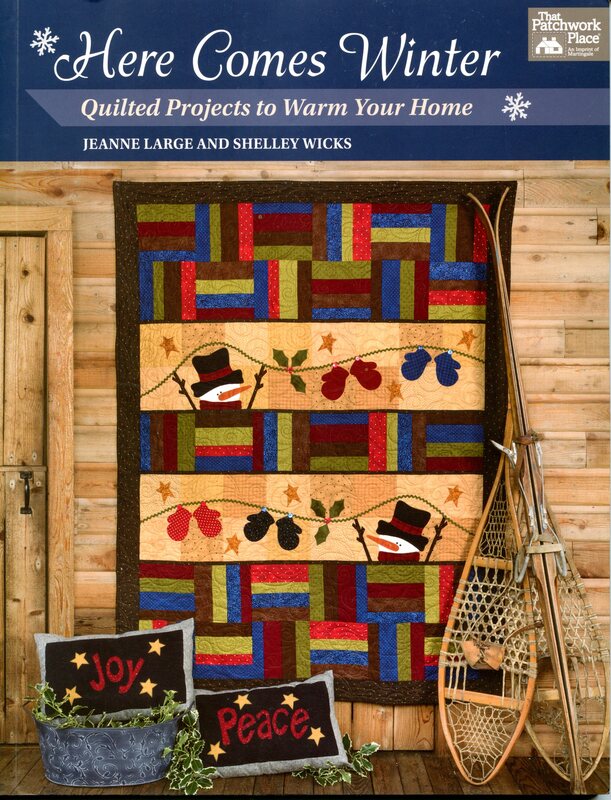 It’s filed under Book Review, Journaling, Sharing Resources, Special Project and tagged "Here Comes Winter- Quilted Projects to Warm Your Home", book review, Jeanne Large and Shelley Wicks, local Moose Jaw authors, The Quilt Patch - Moose Jaw. Bookmark the permalink. Follow any comments here with the RSS feed for this post.